Dennis Rodman is back from his whirlwind tour of North Korea and he comes with some interesting news: Kim Jong Un is basically Mikey from Swingers. "He wants Obama to do one thing: Call him," Rodman told ABC's George Stephanopoulos on "This Week." "He said, ‘If you can, Dennis – I don't want [to] do war. I don't want to do war.' He said that to me." This is just great. Kim Jong Un doesn't want to "do war" with the United States so he's asking Dennis Rodman to do him a solid. 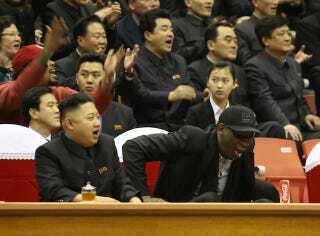 As intermediary, Rodman suggested a possible detente via basketball: "[Kim] loves basketball. And I said the same thing, I said, ‘Obama loves basketball.' Let's start there." As is often the case with tense international politics, however, the two sides must meet somewhere in the middle on even the most basic of points before real progress can be made.